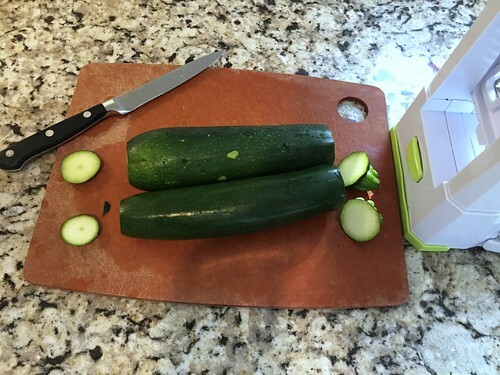 A couple weeks ago, I shared a post about general tips for making, cooking, eating, and storing zucchini noodles (a.k.a. 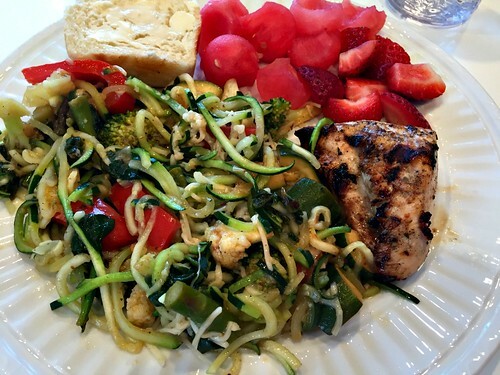 zoodles). I also mentioned how much Dave and I really enjoy eating these yummy, low-carb, high-fiber noodle alternatives in many of our favorite pasta dishes. And it’s true — zucchini noodles are FANTASTIC with any of your favorite store bought or homemade marinara, meat, Alfredo, pesto, or cheese sauces. 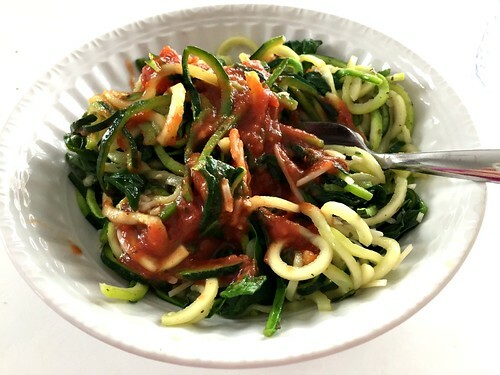 So if you want something REALLY simple, just cook the zoodles as I mentioned in this post and top them with whatever sauce you use for eating regular pasta. Dave and I have eaten this exact recipe (along with many slight variations) more times than I can remember — and every time, we just can’t believe how tasty and easy it is. Plus, the leftovers are fabulous for lunch the next day — which is a huge bonus in my book. 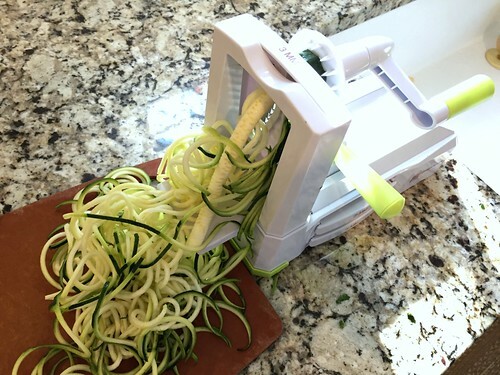 NOTE: This is the spiralizer we use. Heat oil in a large frying pan. Stir in garlic until fragrant over medium heat. 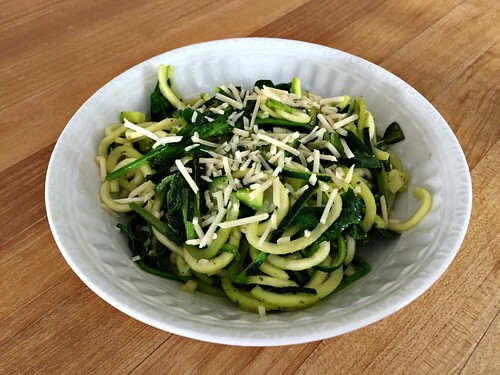 Add zucchini noodles and spinach and cook, stirring regularly, until spinach is wilted (3-5 minutes). If you want to add any of the extras I mentioned above, add those after about 2-3 minutes of cooking. Remove from heat, add Parmesan cheese, and season with salt and pepper to taste. Serve with roasted vegetables, grilled chicken, burgers, steak, salmon, pork chops, or almost anything else! That’s it — literally less than 10 minutes from start to finish; and yes, that’s even including the 45 seconds it takes me to spiralize my zucchini! This basic recipe is so quick and easy, and is a fabulous side dish for almost any type of meat. 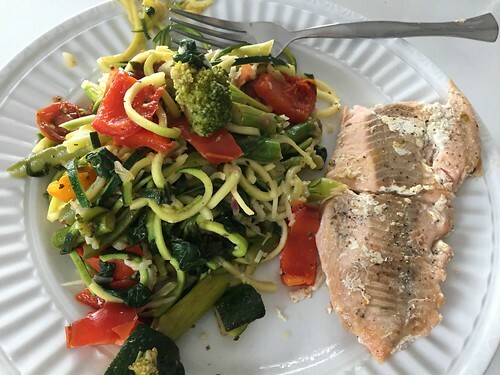 However, as I mentioned above with the “additional mix-ins”, it can quickly transform into a fantastic main dish if you throw in a little grilled meat and/or pre-cooked veggies — which is often how I use up any of our leftover roasted vegetables (roasted broccoli, cauliflower, asparagus, peppers, and zucchini pair really well with zoodles). So far, I haven’t tried freezing the zoodles (we never have enough leftover!) but I’m told it works just fine. Also, for those of you who aren’t quite ready to invest in a spiralizer, you can buy pre-spiralized zucchini in most grocery stores now. 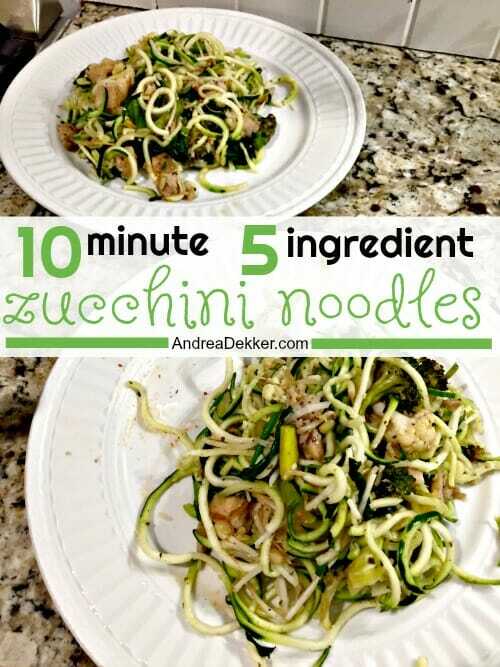 It’s much more expensive than making it at home, but it might be a good way to test your tastebuds to see if zoodles are really something you and your family will eat! Based on how popular spiralized veggies are right now, I have a feeling many Italian restaurants will start serving zoodle options (with an up-charge, I’m sure). Who knows, maybe they already do and I just don’t get out enough! If you have a really great zoodle recipe or tip, leave it in the comments! Thank you for this recipe! This was amazing and I made it twice in one week! This was so yummy! I made it with added stewed tomatoes and diced rotisserie chicken and it was delicious! I also like to make zoodles carbonara. It’s pretty simple too. Just made with zucchini noodles, garlic, bacon, eggs, parmesan, and salt and pepper. Really good and rich tasting! A nice lightened up version of the original. haha — happy to help! 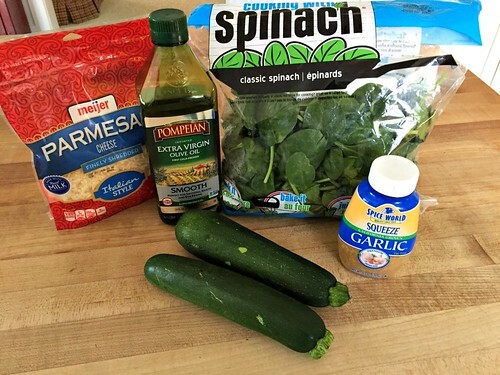 The squeeze garlic was actually on my list of favorite things a couple years ago — I literally use it every day! I just made this for lunch and it was so good! I added chicken and I think I’ll add mushrooms next time too. Super quick especially since I had grabbed zoodles from Meijer randomly this week wanting to try them for the first time! I have a small hand spiralizer, but it takes way too much effort. I have a small kitchen, so limited space for gadgets. 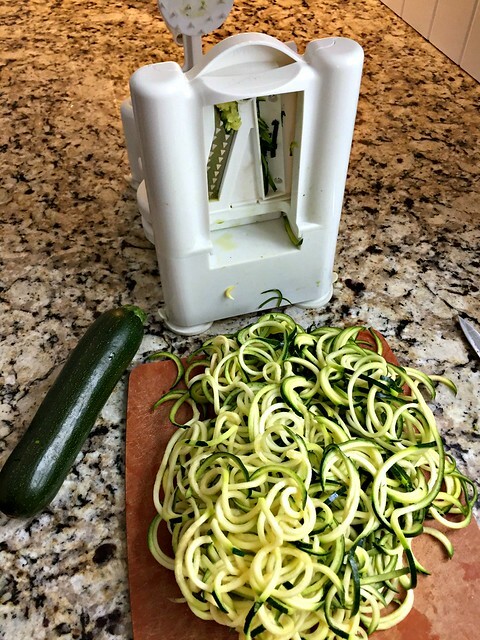 I use my mandolin slicer, with the thin strip option flipped up to make my zoodles. Works like a charm and no wasted core. I flip the strip slicer down, and just make broad flat noodles for lasagna (I’ve tried zucchini, butternut squash, and daikon radish). no need to cook ahead of time – just let them bake with the lasagna. Delicious. 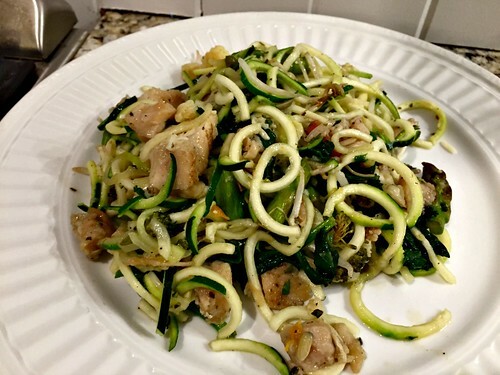 I left some comments on the original post but in case anyone missed it, zoodles do best when sautéed in a very hot sauté pan with a minimum amount of oil to allow the water to evaporate. Too much oil or fat tends to seal the water in. As a homemaker in a paleo / primal grain free household I’ve acquired quite a few tricks for substitutes for our old friends made from grains. There are so many things we don’t eat (grains, quinoa and other saponins, dairy except butter, legumes (but I cheat with green beans and split peas) )that I’ve a handful of standard recipes like zoodles from zucchini and yellow squash, cauliflower rice, cauliflower mashed faux-tatoes, etc. If cooked frequently it gets faster. And yes, I’ve started to get MUCH faster cooking zucchini and sweet potato noodles. I started using Cast Iron a few months ago after being fed up with all other frying pans, and I’m really liking it for the zoodles. But you’re right, it does have to be preheated well before! Also, I’m trying cauliflower rice later this week — something I’ve had on my list for a while now. Not sure what the kids will think as they LOVE rice! Question about the zucchini, do you let it drain before you cook with it? I have seen this method in a couple of cooking zoodle recipes I have watched on youtube. 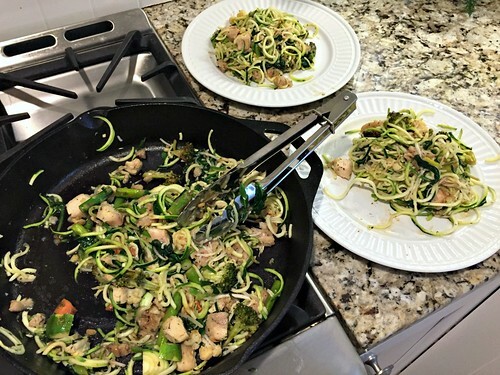 I have tried zoodles before but was disappointed in how “wet” they turned out, so just wondering if you do the same before you cook with them? Also, what is the consistency you look for in the zoodle? I feel like mine were too crunchy before. 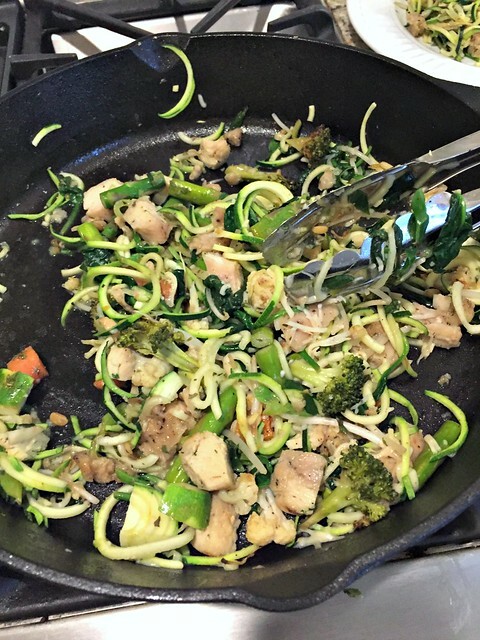 I love that you shared this recipe…trying to find Keto friendly options to make. I don’t let it drain — and sometimes it is a little watery, but the water just stays in the pan when I lift the noodles out, so it has never really bothered me! I too enjoy zoodles. My zoodles aren’t as nicely shaped, as I just have a little hand-held tool. Does your spiralizer come apart for storage? We are so short on kitchen space. You have me tempted by yours though! Thank you for sharing your kitchen tips. Because of you, I have peanut butter balls and berry sauce in my fridge. I am eating lots more zoodles too. I am hoping to try your yogurt recipe later this week. Thank you for always sharing such great (totally doable) ideas! I agree! Where is the squeeze garlic from?!?! oh bummer — the squeeze garlic is THE BEST! our meijer always has it!! I have made a zoodle lasagna that is pretty good. 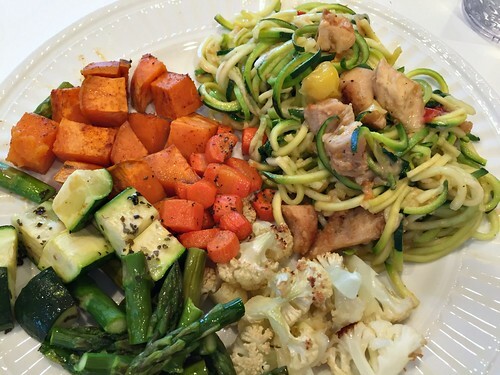 Instead of spiralizing the zuchinni, just cut it into long flat strips. Also, I was wondering if you have tried spaghetti squash? I do it with this same recipe, minus the spinach. My family doesn’t love it, but I do and I often fix it for me and something else for the others. My mom makes zucchini lasagna. I absolutely LOVE IT! I wonder, if you’re frying bacon, can bacon fat be used in place of the olive oil to cook the zoodles? I guarantee that would be deliciously mind-blowing–ha ha!! 🙂 No seriously, I haven’t tried it, but I’ve done enough other veggie stirfries with various fats that I think it would work fine and taste amazing. Good idea! I haven’t tried zoodles yet but I am going to this week and if we like it I’m gonna go stick a few zucchini seeds out in the garden! Has anyone tried using an apple peeler thing that you crank to do zucchini? that MIGHT work if you had a huuuuge zucchini — but if it were a small to medium size zucchini, it would simply remove the entire core of the zucchini and basically leave you with the spiralized skin!